Laut Internetinfos gibts ein Lvl4- Ereignis in Nebraska? Merkwuerdig, gibt es denn gar keine weiteren Infos? liefert bei mir eine leere Seite, warum auch immer. Würde n Plugin empfehlen welches PDFs automatisch auf den PC lädt, statt es im Browser zu öffnen. und da ist eigentlich nur von einem zeitweiligen Feuer in elektrischen Einrichtungen die Rede und das die Kühlung des Fuel Pools anschließend sichergestellt werden konnte. Ansonsten steht die Anlage in einem Überschwemmungsgebiet und ist mittlerweile ringsum von Wasser umgeben. Das liest sich in der Pressemitteilung eigentlich so als wenn da etwas völlig falsch verstanden wurde. Es soll ja seit gestern/heute schlimmer sein. Ob das wirklich zutrifft, lässt sich bei den fehlenden Informationen kaum sagen. Aber wenn das wirklich zutreffen würde müsste es doch entsprechende Meldungen geben. 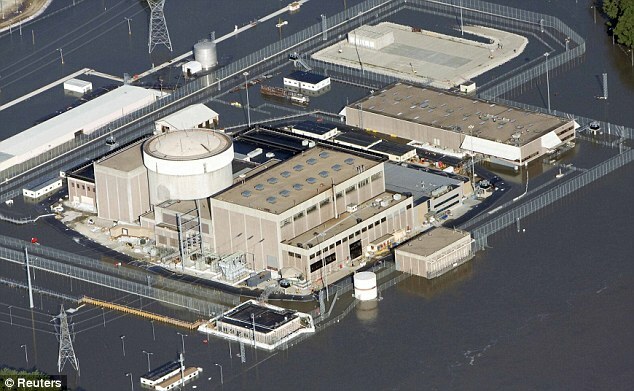 OMAHA, NE (KIOS) - Rising Missouri River flood water has forced OPPD to declare a Notification of Unusual Event at its Fort Calhoun Nuclear Plant. OPPD made the announcement in a news release this afternoon. Such notifications are made when events are happening or have happened that will impact the plant. In the news release, OPPD says the river is expected to rise to 1,004 feet above sea level this week and remain there for at least a month. > Ft Calhoun Spent Fuel In Ground - Pools, Flooded Already? Irgendwie ist es verdächtig ruhig geworden um Nebraska für ein Lvl4-Ereignis. Eben weil's kein Level 4 Ereignis ist. Level 4 bezog sich afaik nur auf das Hochwasser, hab jetzt aber keine Quelle zur Hand. Bei Level 4 wäre es schon zu Schäden am Reaktor gekommen. Das Flugverbot würde übrigens verhängt, damit keine Flugzeuge und Hubschrauber der Presse darüber fliegen um Bilder von der Überschwemmung zu machen und dabei dann zusammenkrachen. Ganz überstanden ist die Sache hier auch noch nicht. Der Wasserstand soll über einige Wochen so hoch bleiben, und teilweise sogar noch etwas höher werden, wenn ich es richtig verstanden habe. Wenn die Barrieren das Wasser nicht mehr zurück halten könnte, mag das hier nochmal unangenehm werden. Wie jedoch in den Artikeln oben beschrieben, hatte man hier Wochen im Voraus Zeit sich auf die zu erwartenden Umstände vorzubereiten - was man auch getan hat. As the Missouri River continues to swell, the US state of Nebraska has issued an emergency flood warning at the Cooper Nuclear Power Station. The Nebraska Public Power District has issued a flood alert for the state's southeast Cooper nuclear plant, the Associated Press reported. "We knew the river was going to rise for some time," said Columbus-based utility spokesman Mark Becker, adding that it was just a matter of time. The water level at the Cooper plant station currently stands at 13.6 meters. If water levels reach 13.9 meters, the station may be shut down. Flash flood warnings have also been issued for several counties in the state of Missouri. Nebraska's Fort Calhoun nuclear plant has been shut down, as water is currently being held back by a series of barriers, including an 8-foot rubber wall. 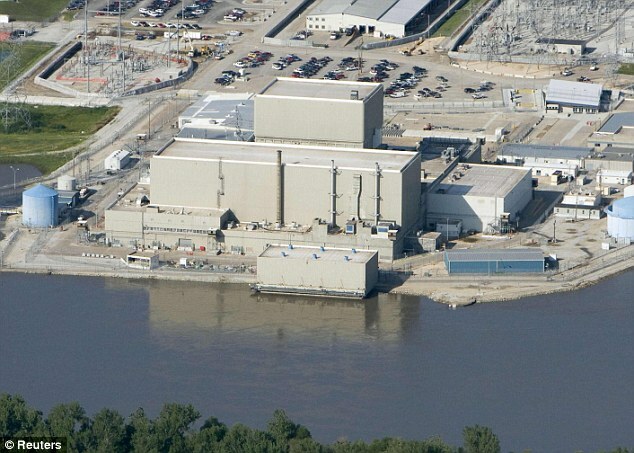 The Cooper and Fort Calhoun nuclear plants are the only plants along the Missouri River. Heavy rainfall and melting snow on the Rocky Mountains are expected to keep the river's water level high until August. Ma abwarten (ob et)was passiert. Die lassen die Anlage(n) bis zum letzten Moment laufen? Hart. Hoffentlich bleiben die Kraftwerke verschont. @Tim: Danke für die Bilder. Der Aqua Dam ist ja ein tolles Teil. Aber wenn es jetzt drüberschwappt... ? Omaha, NE – KVNO News has confirmed that the head of the Nuclear Regulatory Commission, Gregory Jaczko, will likely be stopping in Nebraska on Monday. Senator Mike Johanns’ office confirms the NRC has told his office to expect the Chairman Monday, although the NRC will not confirm the visit. Typically, these announcements are not confirmed until all scheduling is finalized. Das Kernkraftwerk soll aber ok sein. The commission says Gregory Jaczko will visit Cooper nuclear power plant near Brownville on Sunday, and then tour Fort Calhoun nuclear power plant near Blair on Monday. He will also take a helicopter tour of flooding on the river. Die Bilder von cartoradiations sind wirklich gut, der Rest ist aber leider nicht wirklich eine sachliche Information. At approximately 1:25 a.m. Sunday, June 26, the aqua berm providing enhanced flood protection for Fort Calhoun Station was deflated due to onsite activities. The plant is secure. At no time were the fuel cooling systems lost. The plant, basically, is in the same situation it would have been in had the extra layer of protection of the aqua berm not been added. It is designed to withstand waters up to 1014 feet above mean sea level (MSL). The river level currently is at 1006.3 feet MSL and stable. River levels are not expected to exceed 1008 feet MSL. Flood gates and additional sandbagging around the plant were in place many days ago. As a precaution, per plant procedure, the operators started the diesel generators and temporarily disconnected from off-site power. Plant operators later reconnected to off-site power once all safety checks had been completed. U.S. Nuclear Regulatory Commission personnel stationed onsite for flood monitoring have been informed. Local shop owner Katy Morgan, 28, said her fears have been assuaged by information she has received via plant officials, who give out emergency radio equipment to residents within a 10-mile radius of the Cooper plant. Das Cooper-KKW verteilt Notfall-Radio-Equipment an Anwohner? Danke für den Link. Auf was beziehst du dich mit deinem Kommentar? The berm's collapse didn't affect the reactor shutdown cooling or the spent fuel pool cooling, but the power supply was cut after water surrounded the main electrical transformers, the NRC said. Emergency generators powered the plant until an off-site power supply was connected Sunday afternoon, according to OPPD. Hoffen wir es bleibt "safe". Auf die Posts auf den ersten beiden Seiten des Blogs, die ziemlich opportunistisch und teilweise zensiert waren. Anscheinend entwickelt sich ja doch noch eine lebendige Diskussion in diesem Forum, also ziehe ich meinen Kommentar zurück! Tja "der Freund eines Arbeiters des Kraftwerks" .. was will man da groß erwarten. At approximately 0125 CDT, the AquaDam providing enhanced flood protection for Fort Calhoun Station Unit 1 failed. This resulted in approximately 100 gallons of petroleum being released into the river after a protective barrier was breached and many fuel containers were washed out to the river. The fuel/oil containers were staged around the facility to supply fuel for pumps which remove water within the flood containment barriers. Omaha Public Power District spokesman Jeff Hanson said pumps were handling the problem at the Fort Calhoun Nuclear Station and that "everything is secure and safe." >A Nuclear Situation in Nebraska?